Made of chrome plated brass. Each separate lever controls clutch and throttle for one engine. Not fo..
Ball knob black Cable Entry: Black Ball KnobDescription: Fits: ..
A single, electronic solution designed specifically to eliminate all those cumbersome linkages, push..
Cable conn kit Type: 3300/33C/OEM Cable Adapter Kit..
Hardware bag twin s control 30 Description: Hardware Mounting Bag, Twin..
Side mt cont.i/o o/b stop sw Type: Without Trim..
Side mt cont i/o o/b trim/tilt Type: With Tilt & Trim.. Clutch detent kit s and twin s Description: Clutch Detent Kit..
For throttle, choke, fuel shutdown. Uses 33C or 43C supreme cables. Description: DC Control..
Patented Self-Locking Throttle makes it the only control that stops cable creep in single or in seri.. The new Dual Station (DS) unit is designed for inboard or sterndrive boaters that like using one lev..
Dual station kit twin s cntrl Description: Dual Station Kit for 30 Series Cables(2 required for Twin.. Transfer units can be used with Single S, Twin S, Single SR, or Twin SR two lever controls. Recommen.. Incorporating Teleflex's revolutionary No-Feedback technology. Eliminates throttle creep and has neu.. Engineered for boats with mechanical throttle and shift, the KE-4+ is the perfect answer for smooth ..
Mjb side mt cont.dual lever..
For throttle, choke, fuel shutdown. Uses 33C or 43C supreme cables. 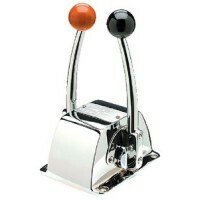 Description: Mounting Bracket..
Dual-function lever controls throttle & shift. Ideal for many outboards, stern drives, and inboards ..
For use with CH4400 series controls. Description: NSS for CH4400 Controls..
Combines classic binnacle styling with dual function levers, a neutral safety switch, and an engine .. Ideal for single and multiple station boats. Removable cover for easy access to the mechanism. Adjus.. Neutral safety switch s contro Description: Neutral Safety Switch.. Neutral safety switch Cable Entry: Neutral Safety SwitchDescription: Fits: .. Neutral safety switch Type: Optional Neutral Safety Switch..
Ball knob red Description: Red Ball Knob.. Features single lever/dual action design. Compact construction is perfect for sailboats and other ap.. Ideal for single or dual station inboard, I/O, and O/B applications. Single function control - each ..
Dual-function single lever control with a push button for engine warm-up. Also has a neutral interlo..
Dual function. A snap to install and a perfect match with most engines; outboards, inboards or stern.. Shift knob 50030 (smooth) Description: SS Smooth Shift Knob..